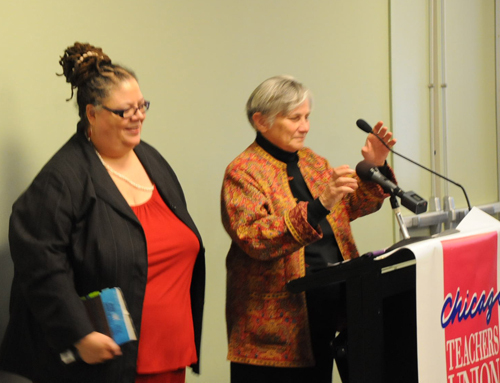 Chicago Teachers Union President Karen Lewis (left) holds her heavily notated copy of Diane Ravitch's best selling book "The Death and Life of the Great American School System" after introducing Dr. Ravitch at the lecture sponsored by the Chicago Teachers Union at the University of Illinois Chicago on March 12, 2011. Substance photo by George N. Schmidt.It was a little after noon on March 12, 2011, and while many from Chicago were downtown at the St. Patrick's Day parade and many others had gone to Madison, Wisconsin, for another massive rally opposing the attacks on public schools and unions, another crowd had gathered at the University of Illinois at Chicago in a long-planned Chicago Teachers Union event to hear historian Diane Ravitch, who has been stirring up the nation against corporate school reform since the publication of her book "The Death and Life of the Great American School System" a year ago. 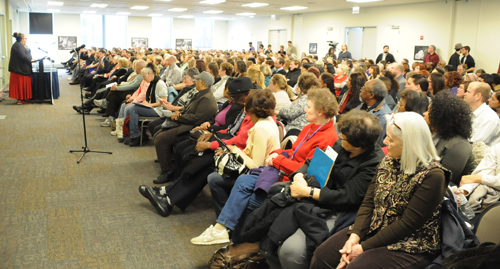 Following a video by Al Ramirez, Chicago Teachers Union Executive Board member and CTU delegate from Ruiz Elementary School, the crowd of more than 500 teachers and others at the University of Illinois at Chicago cheered Diane Ravitch, who was introduced by CTU President Karen Lewis. The lecture by the nationally recognized education historian and author of the best-selling book "The Death and Life of the American School System" began a few minutes late because a line, at one point stretching to the door, had formed to purchase copies of Ravitch's book and get the author to sign it. The Ramirez video featured many Chicago teachers speaking about the challenges facing teachers. By the time the video ended, Substance reporters had counted more than 500 people in the room, which was packed to standing-room-only. Karen Lewis's introduction summed up a lot of what had been happening in the year since the Ravitch book was published, which was a few months before CORE was swept into office in the 30,000-member Chicago Teachers Union. "Very few people can admit we’re wrong," Lewis told the large crowd. "I know. I’ve made plenty of apologies to students. Often for being too sarcastic. I’m willing to reflect on what I do. This is what we do as teachers on a regular basis, but we get no credit for it. Our mistakes are blown out of proportion..."
The size of the crowd (in excess of 500 people, more than a hundred of whom purchased copies of Dr. Ravitch's book) came as no surprise to CTU President Karen Lewis (far left above, introducing the main speaker) as more and more teachers organized to fight against the corporate teacher bashing agenda exposed in "The Death and Life of the Great American School System." Substance photo by George N. Schmidt.Lewis continued summarizing the present state of affairs: "A few months ago there was a full throttle attack on teachers, on our public school system. I heard lies, lies, damn lies and statistics. Sound bites. While things are happening in Ohio, WI, IN, there are organizations not from Illinois that insist on standing on children to push their agenda — a tip of the iceberg coming to crush the union. Coming legislation would strip our bargaining rights to salary, that’s it. Then the state will say it’s broke. "The Common Core Standards go immediately to assessment," Lewis continued. "They skip a coherent curriculum — and teachers are left out of the equation. I could preach forever, but you didn’t come here to hear me. 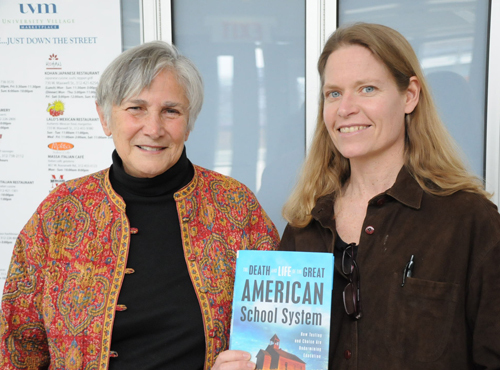 I ‘m thrilled to introduce my friend Dr. Diane Ravitch. Thank you for coming." 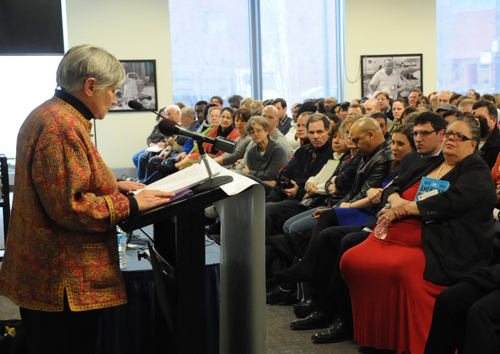 Although he left early and was partly hidden in the huge crowd, Chicago Public Schools Interim Chief Executive Officer Terry Mazany was listening carefully during the lecture by noted historian Diane Ravitch. Substance photo by George N. Schmidt.Diane Ravitch spoke to the teachers for more than an hour, and many were taking notes. No one became bored or inattentive during the entire lecture, which was both from prepared notes and in the form of asides. "A word about Karen Lewis," Ravitch began. "I had read about her and heard about her and read some of her words. I asked to meet when I could be at O’Hare Airport. We talked non-stop for four hours. I just love this woman. She’s smart, has heart, and she’s a fighter. Most important, she’s not afraid..."
Dr. Ravitch then reminded Chicago teachers of our own history, and how the founding of the American Federation of Teachers took place in Chicago because of the work of militant Chicago teachers like Margaret Haley, to whom Ravitch compared Karen Lewis. "The first teachers union ever was created in Chicago by Margaret Healy," Ravitch continued. Teachers were always being underpaid, and the city was always claiming that it didn't have enough money to pay teachers. "She [Haley] investigated the claim that there was not enough money to pay teachers," Ravitch continued. "She found that the corporations weren’t paying taxing. She enabled teachers to get a living wage by pushing for those corporations to pay. Karen is a reincarnation of this tough union leader. Thank you." 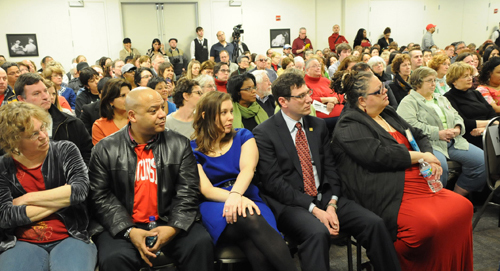 The officers of the Chicago Teachers Union, newly installed on July 1, 2010, following a massive insurgency in the ranks of the oldest union local in the American Federation of Teachers, sat in the front row during the Ravitch lecture. Left to right (from Michael Brunson, wearing the leather jacket and "Wisconsin" shirt) are: Recording Secretary Michael Brunson, Financial Secretary Kristine Mayle, Vice President Jesse Sharkey, and President Karen Lewis (in red dress). Substance photo by George N. Schmidt.Dr. Ravitch then went into a discussion of current events: "I’m embarrassed," she said. "Maybe you should have been somewhere else today, such as Madison. Those people have really lit a fire I’ve been traveling and given more than 90 speeches. I’ve probably talked to more than 100,000 people, mostly teachers. These teachers have been beaten up on, don’t know what to do. They’re looking for leadership. I have one movie to recommend that may explain what is happening to education. 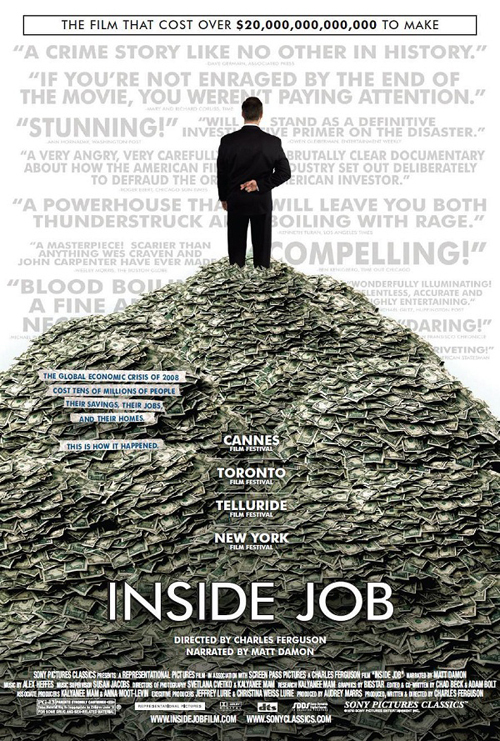 It won the Academy Award for best documentary and no, it isn’t ‘Waiting for Superman.’ The movie is ‘Inside Job’, the best demonstration of what is happening in our schools. It’s about the hedge fund dollars. Corporate school reform is a fig leaf for the real purpose: getting rid of unions. “Corporate school reform calls on legislatures to roll back collective bargaining rights, get rid of unions. But once they’re gone, there is no one to speak for children, for working conditions. The people in Madison are inspiring. They’re still fighting. “You may not know that in 1948 the United Nations passed the Universal Declaration of Human Rights. It declares in Article 23, point number 4 that ‘[e]veryone has the right to form and to join trade unions for the protection of his [or her] interests.’ It’s tyrannies that don’t have this protection. We can’t let it happen here. “I’ve been wondering if we’re in an age of national insanity or an age of national stupidity. 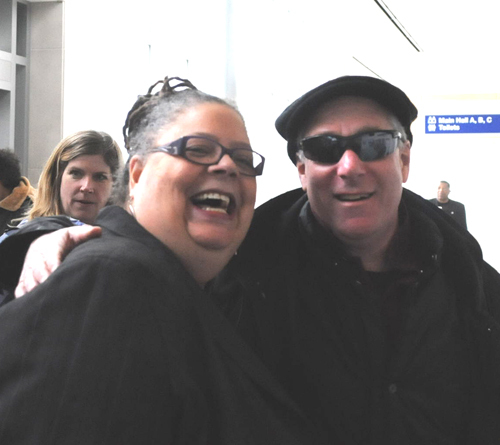 The author and historian with CORE activist and Chicago teacher Sarah Chambers following Sarah's purchase of the book. Substance photo by George N. Schmidt.“While governments and corporate reformers are insisting we must reform schools, they’re cutting the budget and refusing to tax the rich. In Detroit they’re proposing 60 in a class, something we haven’t seen in 100 years. In Providence, RI they gave a pink slip to all the teachers. “Forbes magazine just came out with its list of the 400 richest people in the USA. There are 400 billionaires — with a net worth totally in the trillions — but Congress won’t raise taxes on the rich. In New York state, they’ve let a three percent surtax on the wealthiest people lapse. That tax on the wealthiest people brings in only $30,000 from each million dollars those people have, yet New York has allowed that tax to expire. Do the they really have to have that extra $30,000 per year per million? "Who are these policy makers?" Ravitch asked. Answering her own question, she reminded the teachers that the people making the policies and those having the most influence over them are the wealthiest people. "They’re the ones who let the Global economy collapse in 2008. It wasn’t the teachers. Where any teachers in charge of those hedge funds?" Ravitch then spoke of Wisconsin Gov. Scott Walker’s dead of night maneuver that now ended collective bargaining rights for Wisconsin teachers and other public workers. But she noted that the same attacks on workers' rights are taking place in many other states. In Pennsylvania and Florida they’ve pushed through vouchers and merit pay, tying salary and evaluation with test scores. In Idaho the unions are dead. In Ohio, Indiana and Tennessee the attacks continue. Ravitch noted that corporate education reformer Michelle Rhee endorsed Gov. Walker. And Ruport Murdoch, in The Wall Street Journal and other media he owns, touts the evils of tenure with his coverage of horrible “licentious” teachers. “It seems from reading his newspapers that the more experienced you are the more of a pervert you are,” Ravitch said. “His papers report how you all are getting away like bandits with health care and dental care. “I don’t know if you saw one of these pundits on a clip on the Daily Show saying you shouldn’t tax the rich because $250,000 is really just above the poverty line. But the teachers are making out like bandits. “And where is Arne Duncan? I love Twitter. I’ve been tweeting regularly for Arne Duncan to meet me in Madison. I was there on March 8. I tweeted Arne Duncan. He wasn’t there. Where is President Obama? I tweeted him, too. Why is he not speaking out for the unions? Why did last Friday he go to Florida to meet with Jeb Bush and call him a true reformer? “Where is the logic? Arne Duncan and Bill Gates say we need to cut the budget, that teachers shouldn’t be paid any extra for education or experience and we should raise class size. How can this help? “Gov. Walker claimed that there was a deficit in the Wisconsin budget that called for ending the unions’ collective bargaining rights. But he gave tax breaks to corporations that equaled the deficit. The unions agreed to financial concessions, but his real goal was to remove the unions. “There are teachers, nurses, state workers. I think today there will be a tractor parade of farmers. Teachers are the greatest number. They are inspiring — they’ve got backbone, heart, guts, brains. They can’t sit by silently. They can’t let corporate reformers take over education. “American education is in deep trouble. No Child Left Behind (NCLB) is a failed federal policy. The emphasis on testing has resulted in cheating, teaching to bad tests, and the narrowing of the curriculum that’s resulted in schools that have neglected the arts, sciences, history, physical education and recess. “The mandate that by 2014 all students will be proficient is a utopian goal. (The state with the highest performance statistics is Massachusetts, 100 percent union). The crowd continued to arrive during the lecture, filling the hall. Above, Karen Lewis and the other four officers of the CTU listen and take notes in the front row while Dr. Ravitch goes over the main points from her book, adding current events (such as the recent Academy Award and Madison Wisconsin) to the discussion. Substance photo by George N. Schmidt. "The timetable dictated by American education is that all students are proficient by 2014. Right now, under the rules of NCLB, 82 percent of schools are failing. By 2014 the targets won’t be met. And the educational entrepreneurs are poised, waiting to take over the schools. “Public education is the cornerstone of our democracy. NCLB is a set up, a failure scenario. Part of why Congress overwhelmingly supported NCLB was the 'Texas miracle.' On January 8, 2002, NCLB President George Bush signed the law. The miracle of testing and accountability was really one of measurement and punishment. “The Texas miracle was supposed to be about test scores and graduation rates going up. The only problem with that was that it wasn’t true. The Texas miracle was a fraudulent claim. NCLB should be repealed. “How should we improve schools? Remove all punishments and remedies. They’re all phonies. We need equity for the neediest students. We need sound education for all students. We need to help schools that help the neediest students, not close those schools down. “Who applauds when schools are closed? The Wall Street hedge funds, Democrats for Education Reform (wolves in sheep’s clothing), Stand for Children, The Billionaire Boys Club (Gates, Walton, Broad), various Washington D.C. think tanks, almost all of which are funded by the Gates Foundation, and then influence many of the leading editorial boards. It’s a circular corporate reform movement. A hobby for most, not the “reforms” they want for their children. And I do want to say that whenever we speak of this education reform we label it correctly as corporate reform. “Our politicians think testing is the same as education and that the more we test the higher the scores become. And they mistake harder with better. If the students can’t jump a four-foot fence, let’s raise it to six-foot. What is Race to the Top? It’s NCLB 2.0 or NCLB on steroids. You could call Race to the Top Dash for Cash or Race to the Trough. I ought to congratulate you because Illinois didn’t win. “Race to the Top is a pernicious way to get federal dollars, worse in one way than NCLB — the demand to judge teachers by their students’ test scores. How did Barack Obama develop this education policy? With Arne Duncan, Bill Gates and Eli Broad. None of them teachers or principals or having worked in schools. "They noted that the federal funds competition in Race to the Top negates the principle of the ESEA, which was that funds should go to students based on greatest need. The groups noted that the selection of two small states, Tennessee and Delaware, in the first round of the competition meant that Race to the Top currently impacts only 2.5 percent of the students in the United States eligible for free and reduced lunch, 3 percent of the nation's black students and less than 1 percent of Latino … students. The size of the crowd was best seen from the rear, but it was not possible to get a photograph of the entire crowd. Substance photo by George N. Schmidt. “When the school board voted to fire all teachers in Central Falls, Rhode Island, Arne Duncan and President Obama applauded. The state superintendent was named a hero. But the board and the state destroyed trust and morale. “Across the country, when schools are closed, communities are destroyed. Schools are often the safest places to be, no matter its scores. The new schools that replace the old schools don’t help. Public schools are not chain stores. Public schools are not shoe stores. Public school is public service. Ravitch noted that Finland, due to its high test scores on international tests, is held up as a model by corporate school reformers. However, testing isn’t a regular part of the education, Ravitch said, and the schools are taught by unionized teachers. As part of the National Assessment Governing Board, which oversees federal testing, Ravitch said she read a lot of tests. She noted that many tests are poorly written and riddled with errors. She talked about how little time is devoted to scoring extended responses and how poorly the workers who score tests are paid. She mentioned how easily test scores are adjusted by politicians. 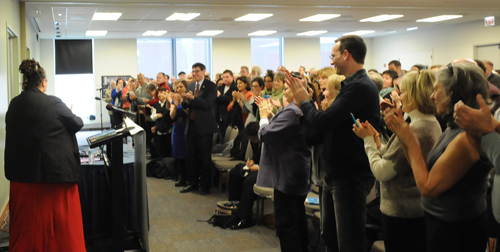 At the end, the crowd gave the lecture a lengthy standing ovation. Substance photo by George N. Schmidt. Ravitch showed how Michael Bloomberg’s New York City mayoral control “miracle” had been manipulated and recently exposed. The touted reading and math scores that showed 69 and 82 percent of students at proficient levels were actually 42 and 54, the same as prior to the eight years of mayoral control. Obama and other corporate education reformers have decried our country’s bottom quartile ranking in the international assessment, the PISA, Ravitch said. Obama has called this our generation’s “Sputnik moment.” The corporate education reformers claim low scores are due to teachers, not poverty, Ravitch said. 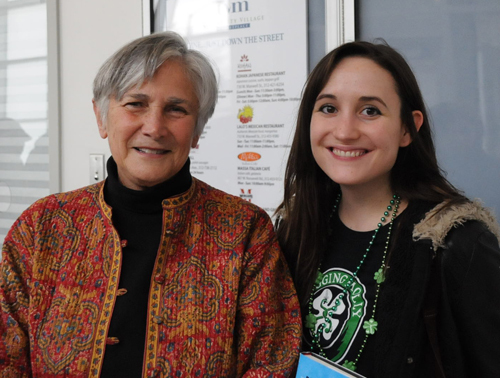 “In the international test comparisons, the schools with low poverty in the U.S. rank first in the world,” Ravitch said. “Poverty drags down achievement, not teachers. But corporate education reformers have taken that issue off the table. They work with innovation (with no evidence whatsoever), disruption and chaos theory. Ravitch mentioned the “coup” of the movie “Waiting for Superman,” highly promoted on NBC. She mentioned that Viocom sponsored the movie and owns NBC. She said that co-producer Participant Media also runs a for-profit on-line college, indebting many first-year dropouts, while paying its president more than 25 million dollars. “Follow the money,” Ravitch said. The lies in “Waiting for Superman” probably kept it from being an Oscar winner, however the movie was firm in its message, that poverty and resources don’t matter in school success, Ravitch said. However, the Harlem Children's Zone and its charter schools have lots of resources that many schools don't. Ravitch spoke about the latest fad for corporate reformers: value added evaluations. She refuted the phrase “data doesn’t lie” with "one word: Enron." Corporate education reform does not acknowledge that teacher experience matters and there is no measure for merit. “Merit pay never works,” Ravitch said. She spoke about the 2010 Vanderbilt study that showed merit pay, including bonuses of up to $15,000, does not change test scores. Other researchers Ravitch sited on the main lessons of merit pay were Daniel Pink and Edward Demming, both asserting that merit pay destroys teamwork. • Give all students a high quality education with fully qualified teachers in place on day one of each school year and provide robust services for special needs and English language learners. • Limits on the use of standardized tests and restoration of recess, library, art, music, languages, physical education and computer classes will return teaching and learning to their rightful place as the focus of our schools and bring back the joy in learning. • A strong teachers union backed up by a contract that protects students, families and educators and improves schools. We need the power to negotiate for smaller class sizes, adequate length of school day, optimal teaching assignments, full course offerings, well-designed school structures and a fair evaluation system. Our contract should not tolerate competition for scarce resources between educators, departments, schools or state regions. In a brief question and answer session following her talk, Ravitch promoted a new group organized by Anthony Cody, an Education Week blogger, that will be marching on Washington at the end of July. See www.saveourschoolsmarch.org. In answer to the question, “What can we do?” Ravitch said "be informed" and "get active in the union." Thanks, Sharon, for such a complete summary of the wonderful Ravitch event. I also agree with something you said in an email about how the history of the abuse of teachers and schools in Chicago under Daley's "DEform" since 1995 should be as known and as publicized as what happened recently in Rhode Island, but it isn't. That's a horror story that perhaps Ravitch will come to incorporate in her wonderful speeches. We have the UPC leadership of Tom Reece and Marilyn Stewart to thank for no one knowing what was done. One thing to note, as George Schmidt has pointed out all over his review of her book -Ravitch promoted this very pernicious attack on teachers and public education when Bush was president. She practically wrote NCLB - that was her baby. I guess like Bill Moyers, who worked for Lyndon Johnson, but now speaks out against wars, some suddenly see the light once their job is completed. Certainly Ravitch is the best, most articulate and eloquent defender of public education today in the higher reaches of power - but she has a lot to explain why she would buy into this testing craze where NCLB mandated everybody be at grade level by 2014. Either she was once a complete idiot to promote this - or something else. I think that's the question people need to ask her. ELLs & CTU contract with Chgo. Bd. of Ed. Though ELLs (English Language Learners)shouldn't be lumped in with "students with special needs", in my view. Ms. Ravitch made the following comment: Give all students a high quality education with fully qualified teachers in place on day one of each school year, and provide robust services for special needs and English language learners. We could help bring this about by ensuring that the following contract measures are followed: It states in article 44.23 of our contract, "The Board shall make every effort toprovide physical facilities for bilingual teachers who have classroom divisions to teach their classes on a comparable basis with other classroom teachers in the same building". and 45-2, A joint Board-Union committee shall continue to study and evaluate the TESL, and bilingual-bicultural education program. and, 6-4. Separate foreign langauge classes for native speakers shall be provided where enrollment makes this possible. 27-1.1 Every effort shall be made to recruit cadre substitutes who meet the needs of students who are English Language Learners and, 27-2, At no time should a TESL or bilingual class be discontinued so that substitute service be performed by teachers of these programs, and 44-35, the substitute center shall maintain a list of bilingual substitutes, and shall make every effort to provide a bilingual day-to-day substitute in the case of the absence of the bilingual teacher. My own three benefitted from decent Bilingual programs while in the CPS system, so it is never to late to give back. Hello? Are you out there fellow (y compañeras) BL / BC Ed. activists? And all educators of good will, which means all of you. Lets don't give the charter school sell - outs the ammo, by not monitoring these articles, when we know it works, that is, learning and growing in two or more languages. Did you see who showed up? Thank you Substance for you continued support and excellent reporting of the CTU and all things dealing with local education issues here in Chicago. However, I am a bit disappointed to see that you failed to acknowledge that CEO Terry Mazany and CEdO Dr. Charles Payne were at the Diane Ravitch event. We ask for our board to collaborate with us and here they were doing just that. We owe them the recognition. 'S'... Doesn't your browser do graphics? Either your browser doesn't do graphics or you didn't read the entire article. 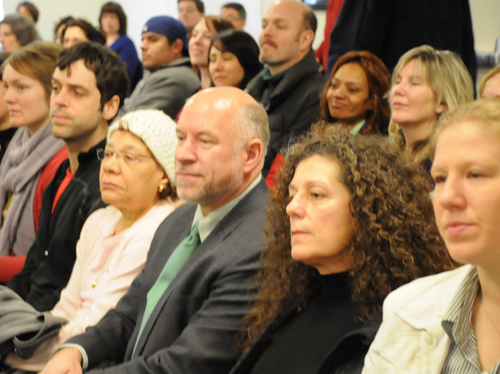 The third photograph accompanying the article above is of Terry Mazany in the Ravitch crowd. 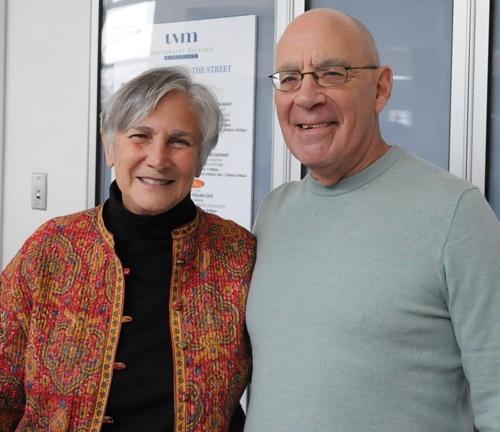 The story, however, is about what Dr. Ravitch (and Karen Lewis) said, not about the couple of non-teacher wannabes who happened to stop by. Before someone goes overboard about this Terry Mazany and Charles Payne stuff (back in the day, nobody at my Alma Mater went around calling one another "Doctor" this and "Doctor" that, by the way, even someone as world renowned as Hannah Arendt or Hans Morgenthau) — what's the big deal? Neither of those guys has earned a thing they're claiming now. And before anyone gets all fussed out about Mazany being a good guy because he told the truth (a rare thing, of course, at 125 S. Clark St.) about the Huberyears and the Hubernuttiness, let's remember that he was pushing all the privatization stuff all those years from the heights of Chicago Community Trust. Mazany spent a lot more time with union busters like the charter schools crowds (all those differentiated edupreneurs) and Phyllis Lockett (roommates, virtually, at CCT) than he ever bothered to spend talking with real inner city veteran CPS union teachers. As to "Doctor" Payne, same thing. This mayoral control plague has left us so that if the mayor dubs somebody (even someone as laughable at Arne Duncan, or Ron Huberman) THE BOSS, then by definition that person is supposed to be... What, exactly? Even Barbara Eason Watkins had more Chicago classroom cred than the latest "Chief Education Officer" of CPS. She may never have taught much in Chicago, but at least she was principal of McCosh for a while, goosing up those test scores so that Arne Duncan couldn't resist putting her lucratively — man, between her CPS pension and her current pay over by the Lake, she's the quarter million dollar doctor now — in charge of greasing the "Renaissance 2010" skids. The "Chief Education Officer" under Arne Duncan destroyed more schools and veteran teachers' careers than anyone during the 20th Century. Or wasn't she responsible for turnaround and all those teacher bashing attacks she mewled about so sanctimoniously while destroying lives, schools, and careers back in the day? Or have we forgotten how she told the Edison parents (and others) four years ago not to bother organizing against that white supremacist move because, after all, it was, Chicago-style, a "Done Deal." So why should any teacher (or parent with kids in the real public schools) write more about Mazany and Payne being there surrounded by teachers than Substance did? But there is much more editorial and reporting to do here, so let's just say the article might have included 200 or 300 quotes from real veteran Chicago public school teachers long before we needed to run anything from two guys whose careers have been spent on the other side. Or did we miss something about all that nefarious work going on along the Midway pushing the University of Chicago's business model for its imperial charter school(s) and all that union busting and teacher bashing PhD and EdD level nonsense. Next thing you know, you'll be saying we should be happy to know that Mayor Rahm is going to make another U of C Robotnik the top dog at CPS. Or have we missed something about how Catalyst is warming up the crowd for Timothy Knowles, who is truly clueless about real CPS realities? Once again, "independent reporting on school reform" brings Chicago another shill for corporate union busting teacher bashing privatizing attacks — just like they greased the official skids for Arne Duncan and then spent their days taking Ron Huberman's data driven drivel all so seriously. 1. What happened with the Whittier School Library? 2. There have been only 2 question and answer periods out of 6 at the latter part of the House of Delegate regular meetings during the current CTU administration. 3. Why the delay in action of the CTU in following through on the House approved collection for Haiti relief? 4. When will the annual CTU audit be published in the Union Teacher? (Such audits have been previously published in the Jan. or Feb. issues). 5. What happened to the CORE lawsuit charging the CPS with racial discrimination in the hiring of black teachers? 6. The long remarks by Lewis and Sharkey at the Feb. House of Delegates meeting helped delay the House consideration of the City Council and mayoral endorsements and helped prevent the consideration of the legislative program. 7. It was improper for Lewis not to bring the Executive Board endorsement of Braun to the House as an item for action. 8. 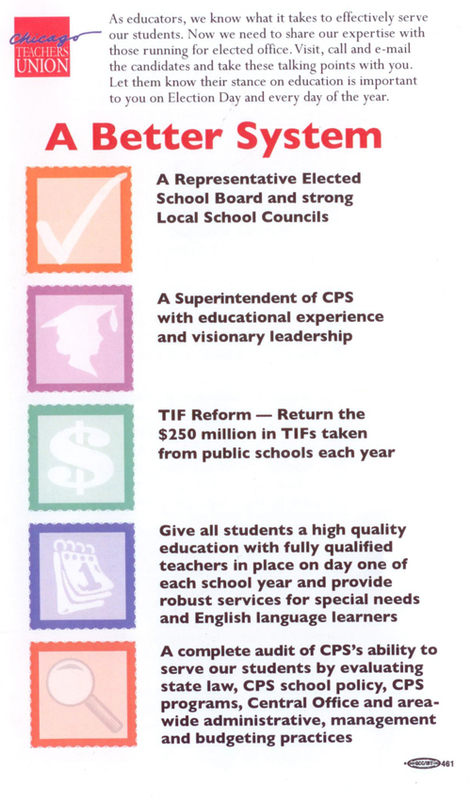 When will the House have an opportunity to discuss the IFT reform plan, supported by the CTU officers, that includes a provision for evaluation as part of the determination in laying off teachers? 9. The newly proposed endorsements for City Council by the CTU non-elected Political Action Committee must be approved by the House. There is no scheduled House Meeting before the April 5 runoff. How much CTU PAC money was used in the first round and how much is scheduled to be used in the second round of City Council elections? 10. The CTU should provide a complete list of the CTU staff with each staff member's responsibilites. The listing of staff members in the CTU calendar/datebook is incomplete. 11. The original decision of the executive director of the IELB on the CTU unfair labor practices charges against the CPS layoffs was made on Nov. 10, 2010. Why did the CTU not inform us of the decision at that time? The newly ordered hearing on these charges will be in May or June.